MILLIGAN COLLEGE, TN (Dec. 13, 2013) — Milligan College announced plans to begin offering a social work major in fall 2014. 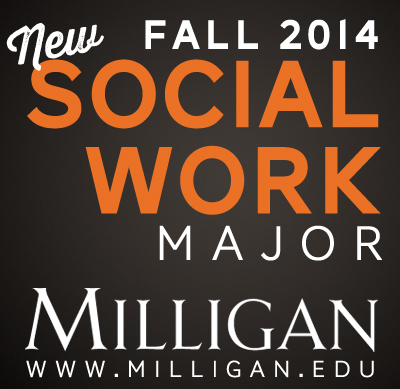 Students who pursue the major will earn a Bachelor of Social Work (BSW) degree. The new major also addresses a need for more social workers. The U.S. Bureau of Labor Statistics projected a 25 increase in the number of social workers needed by 2020 in comparison to the number in 2010. Milligan’s new major will address all aspects of standard social work theory, practice and procedures within a Christian framework. It includes emphases on ethical issues, student practica and contemporary social work policy. For more information about this program visit the Social Work listing in the catalog. To learn more about Milligan’s other 100-plus majors, minors, pre-professional degrees and concentrations in a variety of fields, visit www.milligan.edu or call 800.447.5922. Posted by tommy on December 13, 2013.